Home / Wine Tasting Notes / A Drive By Sip and Spit . . .
A Drive By Sip and Spit . . . I read a wonderful article this morning in today’s Santa Barbara News Press entitled Tercero Wines – An Anatomy of a Drive-By Sip and Spit. The article was written by Dennis Schaefer, who has followed Santa Barbara County wines and wineries for quite some time. So what happened? I think a number of elements worked against Tercero Wines. The first is Mr. Schaffer’s wines are not over-ripe, not necessarily fruit forward and not in your face. They are serious wines that take time to develop in the bottle and in the glass. If a critic is tasting through a couple hundred wines, the more bombastic, alcoholic and fruit forward are going to make an impact, while the more brooding and tightly wound wines, like Tercero, are going to fade into the background. Second, Mr. Schaffer was an active participant in Mr. Parker’s interactive bulletin board website, where he often voiced his honest opinion, for example, on filtering the finished wine to prevent microbiological spoilage in the bottle. Mr. Schaffer is for it; Mr. Parker is against it. 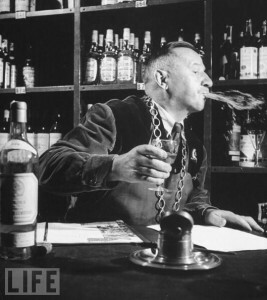 Third, it is widely reported that Mr. Parker does not taste the wines blind in his West Coast swings; consequently, the recognition of Tercero Wines on the tasting table could trigger, unconsciously or consciously, a critical backlash and thus retributive payback for Mr. Schaffer. I’ll post more later, but needless to say, he enjoyed our wines a lot more than Mr. Parker did, and his remarks about them mirrored what most others have had to say about them. At the end of the day, what’s the take home message?!?!? Trust YOUR palate – and drink what you like, not what someone else tells you THEY like and therefore you should like it as well . . .